San Antonio, TX – On Saturday, April 11, Parents Step Ahead (PSA), in partnership with and title sponsor Nissan, celebrated a “Family Day” at two Northside Independent School District Schools (NISD). Teachers, students and parents came together as part of the efforts to celebrate family union. For the third year in a row, PSA hosted a “Family Day” dedicated to beautifying Anson Jones Middle School and Cable Elementary School. More than 200 volunteers participated in the school projects, made possible by the sponsorship of Parents Step Ahead and Nissan. Breakfast was provided by McDonald’s for all attendees. Cable Principal Rosie Siller and Anson Jones Administrator Sandra Soto offered opening remarks, along with NISD Superintendent Dr. Brain T. Woods. John Jay High School’s Mariachi Ensemble performed during the kick-off, under the direction of teacher Alexandra Velasquez. Northside ISD Superintendent Dr. Brian T. Woods with student volunteers for the beautification projects. “It’s very important to us that organizations like Nissan and Parents Step Ahead help us come together, like today, to show our students that by engaging in the community it can help evolve into a global community union Having companies like Nissan partner with Parents Step Ahead will give this school and the student body a future to look forward to,” said Anson Jones Administrator Sandra Soto. The schools projects were selected to enhance the learning environment of each campus, which included a repainting of benches, cleanup work, and improvement of an outdoor learning site. Student workers at Cable Elementary School. classroom seating. Parents, faculty members, students, small children and community members helped built outdoor benches and 120 colorful stepping stones. These benches will facilitate outdoor use of the garden area as a classroom. Experts from Home Depot assisted volunteers in the building of the wood benches, while students created colorful stepping stones in the covered courtyard with their parents. Anson Jones’ project included a repainting of school benches and restoration of the school mascot. Student & teacher volunteers showcase the newly repainted benches. The day concluded with the announcement of the student’s car drawing contest winners and selection of teacher participants for an educational trip to Washington, D.C., that will take place on September 8-12-2015, thanks to the support of Educational Testing Service (ETS). The “My Future Nissan Car, Innovation that Excites” art contest was an initiative from the participating schools. 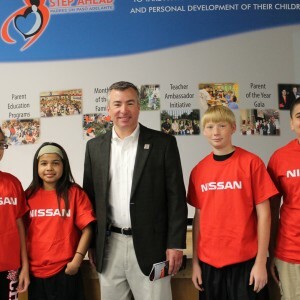 Nissan provided prizes for five finalists from the NISD campuses. First-place winners of the art contest were: Brooke Flores from Cable Elementary, Isabell Garcia from Anson Jones and Lexi Nevara from John Jay High School. Teachers traveling to DC during in September are: Kevin Vanlanham, History Teacher at Anson Jones Middle School; and Academic Specialist Laura Butterfield and Third Grade Teacher Alexandra Muñoz from Cable Elementary. Winners of the Teacher Ambassador trip to D.C. Alexandra Muñoz (center left), Kevin Vanlanham (center) and Laura Butterfield (center right). Nissan Motor Co., Ltd., Japan’s second-largest automotive company, is headquartered in Yokohama, Japan, and is part of the Renault-Nissan Alliance. Operating with more than 244,500 employees globally, Nissan sold almost 5.2 million vehicles and generated revenue of 10.5 trillion yen (USD 105 billion) in fiscal 2013. Nissan delivers a comprehensive range of more than 60 models under the Nissan, Infiniti and Datsun brands. In 2010, Nissan introduced the Nissan LEAF, and continues to lead in zero-emission.